Passed Graduation with 50% Marks and B.Ed Degree and CTET Exam Qualified for I to V Class. (Note- Candidate Should Check Official Notification for More Details). 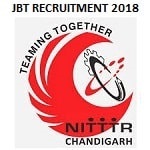 Eligible Candidates can Submit Application to the Official Website of NITTTR Chandigarh Latest by 1st November 2018. Applicants First Logon to NITTTR Chandigarh Official Website. Open Samagra Shiksha, Chandigarh Recruitment Link in Latest News Section at Home Page. Click on View Details Link. Open and Read User Manual Carefully. Register by Clicking on New User Register Link.